When youthful and frisky, Albert Einstein would refer to himself as "the valiant Swabian," quoting the poem by Ludwig Uhland: "But the valiant Swabian is not afraid." Albert — the name Abraham had been considered by his unreligious parents but was rejected as "too Jewish" — was born in Ulm, in March of 1879, not long after Swabia joined the new German Reich. Albert's teachers, though giving him generally high marks, noted his resistance to authority and Germanic discipline, even in its milder Bavarian form. As early as the age of four or five, while sick in bed, he had had a revelatory encounter with the invisible forces of nature: his father brought him a compass, and, as he later remembered it, he was so excited as he examined it that he trembled and grew cold. In 1905, Einstein produced in rapid succession five scientific papers that (a) proposed that light came not just in waves but in indivisible, discrete packets of energy or particles called quanta; (b) calculated how many water molecules existed in 22.4 litres; (c) explained Brownian motion as the jostling of motes of matter by invisible molecules; (d) expounded the special theory of relativity; and (e) asserted that mass and energy were different manifestations of the same thing and that their relation could be tidily expressed in the equation E=mc². In 1903, Einstein had not been able to secure any teaching job; his cavalier and even defiant attitude toward academic authority worked against his early signs of promise. Marcel Grossmann, a brilliant math student whose meticulous lecture notes helped Einstein get high grades at the Zurich Polytechnic, managed to secure him a job at the Swiss Patent Office, in Bern. The general theory of relativity took longer, from 1907 to 1915, and came harder. Generalizing from the special theory's assumption of uniform velocity to cases of accelerated motion, and incorporating Newton's laws of gravity into a field theory that corrected his assumption of instant gravitational effect across any distance, led Einstein into advanced areas of mathematics where he felt at sea. Paul Dirac called general relativity "probably the greatest scientific discovery ever made," and Max Born termed it "the greatest feat of human thinking about nature, the most amazing combination of philosophical penetration, physical intuition and mathematical skill." Though Einstein was to reap many honors and was to serve humanity as a genial icon and fount of humanist wisdom for three more decades, he never again made a significant contribution to the ongoing life of the physical sciences. The scientist is possessed by the sense of universal causation. ... His religious feeling takes the form of a rapturous amazement at the harmony of natural law, which reveals an intelligence of such superiority that, compared with it, all the systematic thinking and acting of human beings is an utterly insignificant reflection. This feeling is the guiding principle of his life and work, in so far as he succeeds in keeping himself from the shackles of selfish desire. In 1913, an invitation was personally delivered by two pillars of Berlin's academic establishment, Max Planck and Walther Hermann Nernst, to come to Berlin as a university professor and the director of a new physics institute, and to become, at the age of thirty-four, the youngest member of the Prussian Academy. Einstein stayed in Berlin until 1932, when the combination of rising Nazism and tempting offers from America impelled him to leave Germany. He loved America, and never returned to Europe, let alone to Germany, whose crimes, he wrote the chemist Otto Hahn, "are really the most abominable ever to be recorded in the history of the so-called civilized nations." In his own freedom of thought, the valiant Swabian demonstrated how to be free. AR Einstein is a wonderful inspiration — great physics and a lovable human being. Walter Isaacson seems to have done excellent work in this book. And John Updike is always not only insightful but also a pleasure to read. The myth of Einstein presents us with an elderly sage, a clownish proto-hippy with long hair, no socks, and a bumbling, otherworldly manner. As Isaacson writes it: "Adding to his aura was his simple humanity. His inner security was tempered by the humility that comes from being awed by nature." Jürgen Neffe's book was a big success in Germany. Neffe also tells the heroic story of the scholars hired by the Einstein Papers Project to catalog and publish Einstein's collected papers. The project was launched in 1986 under the joint sponsorship of Princeton University Press and the Hebrew University of Jerusalem. As Neffe explains, the executors "made life difficult for anyone who tried to gain access to the approximately 42,000 items in the archives." Anyone who really wants to get to know Einstein can do no better than immerse themselves in the books and papers coming out of the Einstein Papers Project, which has so far published ten volumes of correspondence and writings spanning the period from Einstein's youth up to 1920. Less ambitious readers will find Isaacson's workmanlike biography well worth reading. The young Einstein, the one who actually made the great discoveries we associate with his name, is nothing like the mellow sage described during his Princeton years. He was seen by his contemporaries as arrogant, intolerant of authority, charismatic, good-looking, manipulative, and avidly engaged in his relationships with women, his children, his friendships, his music. We need to know how this revolutionary turned into the otherworldly sage. Einstein's letters show that in fact he was capable of considerable sensitivity to the feelings of other people. Here, in a letter quoted by Isaacson, is how he resolved a difficult conflict with the great mathematician David Hilbert over who should get credit for the equations of general relativity in December 1915: "There has been a certain ill-feeling between us, the cause of which I do not want to analyze. I have struggled against the feeling of bitterness attached to it, with complete success. I think of you again with unmixed geniality and ask you to try to do the same with me." The discrepancies in the myth of Einstein are important, not so much for their own sake but because they point to contradictions in the perception of his scientific legacy held by laypeople and scientists alike. The early Einstein was brash and revolutionary. His thinking was closely tied to experimental science and engineering practice. It was intuitive. The key issue in the assessment of Einstein's later years is his conviction that quantum mechanics could not be correct. Although in 1905 he had been the first to identify the need for a new quantum physics, he dissented strongly from the view that our understanding of quantum phenomena was put in final form by the invention of quantum mechanics. By the time Einstein moved to Princeton in 1933, he had already parted ways with most of his colleagues. Although all the subsequent developments in physics were based on Einstein's early work, Einstein left very little legacy from his work at Princeton within the scientific community. There is an entire field now devoted to questions raised by the counterintuitive aspects of quantum mechanics called the foundations of quantum mechanics. Einstein had principled objections to the quantum theory. Einstein's executors saw their role as establishing the legacy of one of history's greatest scientists. But the man himself was an embarrassment. Politically he had supported causes such as socialism, pacifism, and racial justice. Einstein's political engagements were an embarrassment even for the director of the Institute for Advanced Study. Einstein's scientific colleagues had even more to gain by the establishment of a myth that left him honored but unheeded. During his years as a professor and director of the Kaiser Wilhelm Physical Institute at the University of Berlin up to 1933, Einstein was a formidable obstacle to those who sought to establish quantum mechanics. But once Einstein moved to the Institute for Advanced Study at Princeton he was no longer seen as a leading figure among scientists. His dissent from quantum mechanics and his entire philosophical approach to scientific research was an embarrassment to his younger American colleagues. The solution was to elevate Einstein to the status of a sage. Einstein was famous, as no scientist has been before or since, so his every move was under scrutiny. And, in view of the tragedies that had driven him to give up his European home and move to America, we can imagine he felt compelled to continue to use his fame to speak out for principles and causes he believed in. Einstein's dissent from quantum mechanics and immersion in the search for a unified field theory were not failures but anticipations. Many string theorists would disagree with Einstein about the incompleteness of quantum mechanics, but much of what goes on in string theory these days looks a lot like what Einstein was doing in his Princeton years. None of the biographers mention the writings that look "to a renunciation of the space-time continuum, and to a purely algebraic physics." What Einstein is saying is that the smoothness of space is an illusion and the fundamental description of space will be in terms of algebra and not geometry. This is precisely where most current work on unifying quantum mechanics with general relativity, apart from string theory, has led. Non-commutative geometry, spin foam models, loop quantum gravity, quantum causal histories, and others are each based on such an algebraic framework for spacetime. Einstein appears to have anticipated much of contemporary research aiming to bring together and close the great revolutions he began. As for quantum mechanics, a significant proportion of those who have thought the matter through find themselves in agreement with Einstein. AR Lee Smolin has enlisted Einstein in support of his own views on string theory and loop quantum gravity, and quite rightly too. Anyone in physics now with the sort of temperament Einstein displayed a hundred years ago should be looking at radical approaches to quantum gravity, such as the topoi approach of Isham and Döring and the twistor ideas of Roger Penrose. We need to put Einstein the mythic clown aside and focus on the burning foundational issue in physics before we leave Einstein's ghost to rest in peace. Assuming that the two signals are traveling at the same speed, Einstein wrote, "is in reality neither a supposition nor a hypothesis about the physical nature of light, but a stipulation which I can make of my own free will in order to arrive at a definition of simultaneity." "The speed of light is either constant or not, and only measurement can decide what it is," writes Hans Ohanian. We have all heard that math wasn't Einstein's strong point, and Ohanian ruthlessly lays out the details. A 12-page marathon calculation in Einstein's doctoral dissertation, "A New Determination of the Molecular Size," was "a comedy of errors" based on "zany" physical assumptions. "Einstein's dissertation should have been rejected." Einstein went on to commit more errors in the papers he wrote in 1905, what came to be called his miracle year. The miracle, as Ohanian tells it, is that Einstein could have been wrong on so many details while coming through, in the end, with some of the greatest insights of the century. E=mc2 was not such an important equation. But Einstein left a hole in his argument "almost big enough for a truck to drive through." He proved the case for slow-moving bodies and then extrapolated to fast-moving ones. "The mistake is the sort of thing every amateur mathematician knows to watch out for," Ohanian scolds. Sometimes, Einstein's friend Marcel Grossmann tried to help him with his figures but not always to good effect. When Einstein was trying to get his mind around curved space-time, one of Grossmann's bungled equations led him astray. Einstein didn't notice. Some of what Ohanian marks down as errors seem more like philosophical disputes. Einstein's quest to find a unified theory and to expunge quantum craziness from physics ultimately failed. But that doesn't mean it wasn't a noble attempt. Most important, Ohanian notes, Einstein's instincts were dead on. Light is made of photons. Mass is equivalent to energy. Space-time is curved. Nothing can exceed the speed of light. 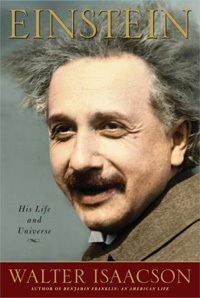 Einstein, Ohanian writes, had "a mystical intuitive approach to physics." AR Einstein is still a wonderful inspiration. Ohanian has added a few touches of shadow to the portrait. Good move. The emergence of modern quantum mechanics is a difficult story to tell. So many different threads have to be woven together that a chronological narrative can't be given. Gino Segrè has focused on the Copenhagen conference of April 1932. The Copenhagen gatherings were held annually from 1929 to the onset of the Second World War. The 1932 conference was the fourth. Segrè looks at seven key physicists. One of them, Wolfgang Pauli, did not actually attend the 1932 meeting. Three others of Pauli's generation (ages 25 to 31) were present in Copenhagen: Paul Dirac, Werner Heisenberg, and Max Delbrück. To balance these four young revolutionaries, Segrè includes three older (ages 46 to 53) participants: Niels Bohr, Paul Ehrenfest, and Lise Meitner. The year 1932 was pivotal for quantum mechanics. The theoretical foundations had been laid down, from Max Planck's great 1900 paper implying the quantization of energy through Pauli's postulating of the neutrino at the end of 1930. Now the experimentalists were taking over. Weeks before the 1932 conference, James Chadwick observed neutrons. In the summer of that year, Carl Anderson observed the positron, postulated by Dirac in 1928. Experimental results then came thick and fast. The year 1932 was preceded by a long theoretical slog that culminated with a sensational burst of creativity from 1925 to 1930: Heisenberg's matrix mechanics, Schrödinger's wave mechanics, Pauli's exclusion principle, Heisenberg's uncertainty principle, and Dirac's relativistic equation. It was followed by the great experiments: Anderson's positron, the splitting of the atom, Fermi's chain reaction, the Bomb. Four of Segrè's seven key physicists were Jewish or of Jewish descent. Three of the four fled the Nazis. Pauli went to the United States, then to Switzerland. Meitner went to Sweden, then England. Bohr took the same route as Meitner somewhat later, going on to the United States, but returning to Denmark after the war. Of the Gentiles, Dirac relocated from Cambridge to Florida in 1970, Delbrück switched to molecular biology and lived out the rest of his life in California, while Heisenberg stayed in Germany through the war and afterwards, to his death in 1976. What precisely Heisenberg was up to in the war years remains unclear. Paul Ehrenfest shot himself in 1933, five days after attending that year's Copenhagen conference. The darkening shadows over Europe, and the decision by his beloved friend Einstein not to return to Germany, were factors in his unhappiness, but there were personal issues too. Niels Bohr convened the Copenhagen conferences. Bohr had made his name as a physicist with five papers published between 1913 and 1915 defining what is now known as the Bohr model of the atom. He had studied under Ernest Rutherford at the University of Manchester. His five papers had resolved some conundrums raised by Rutherford's "solar system" model for the atom, by applying Planck's quantum principles to the electrons in their orbits around the nucleus. Having achieved fame, Bohr was in want of a professorship. Denmark responded by creating its first professorship in theoretical physics and appointing him to fill the position. Bohr returned to Copenhagen in 1916. Bohr spent the next few years in lecturing and energetic fundraising. By 1921 he had his own institute in Copenhagen. It would be a haven for many of the world's greatest physicists for the next decade and a half. The Copenhagen phase of modern physics was underway. The terrific theoretical turmoil of 1925-27 brought forth a new way of thinking about the subatomic world. These were the years when it dawned on researchers that our everyday intuitions are simply not appropriate to events in the realm of electrons and protons. The Solvay conferences had begun in 1911. The 1927 conference was the fifth. Einstein was 48 years old. Segrè quotes him as saying to a friend: "I have thought a hundred times as much about the quantum problems as I have about the General Relativity Theory." In December 1926, Einstein wrote to Max Born: "Quantum mechanics is very impressive. But an inner voice tells me that it is not yet the real thing. The theory produces a good deal but hardly brings us closer to the secret of the Old One. I am at all events convinced that He does not play dice." By the time of the Solvay conference ten months later, Einstein had definitely set his face against the Copenhagen interpretation. Throughout the conference, Bohr and Einstein engaged each other in private conversations. Though Einstein could not be reconciled to the Copenhagen interpretation, he and Bohr repeatedly expressed their admiration for each other. It was in this period that the deep metaphysical problems posed by quantum mechanics first came into view. Segrè: "Now, almost eighty years after Solvay, the repeatedly verified Bohr interpretation still stands, as solid as ever, but still questioned, as it should be." Aspects of quantum mechanics — the ontological status of Schrödinger's state vector, and of the wave function's collapse when it encounters an observer — remain matters of argument today. Most working physicists accept the math as an adequate description of all their measurements without fussing over the underlying realities. Others accept the wave function but balk at the collapse, preferring a "many worlds" interpretation in which the superpositions of the wave function persist in realms inaccessible to each other, each realm presumably populated by its own observers. Segrè writes that it "came as somewhat of a revelation to find what a key figure Bohr was" in these critical years. The Dane was an intellectual impresario, responsible for making Copenhagen "the mecca of theoretical physics." Many of these physicists were very young. Wolfgang Pauli had formulated the exclusion principle by the time he was 25. Werner Heisenberg was only 23 when he discovered matrix mechanics and just 25 when he developed the uncertainty principle. Paul Dirac's reconciliation of quantum mechanics and special relativity came when he was 26. All three eventually received the Nobel Prize for work they had done before the age of 30. The revolutionary discoveries in the 1920s inspired the term Knabenphysik — boys' physics. Even for the revolutionaries, the transition from being prodigies to professors was difficult. Gino Segrè has written an admirable book. AR Einstein never really "grokked" quantum mechanics, but who ever did? Richard Feynman didn't, despite his Nobel Prize for QED. No cause for shame — cause rather for me to get to work and explain my fancy new way (hatched when I was 25, although I didn't understand my own ideas until many years after 1975) to grok it!